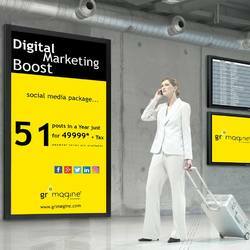 GR Imagine is Ahmedabad based Digital Marketing Agency providing 360 degree Digital Marketing Services in India. Our Digital Marketing Services includes Digital Marketing Intelligence, Search Engine Optimization, Search Engine Marketing, Search Engine Advertising, Social Media Optimization, Social Media Marketing, Pay Per Click & Ecommerce Solutions. we are passionate about all things digital and effective business results for you. Our expertise lies in applying advanced e-Marketing knowledge to complex business issues and delivers robust solution to create best online customer experience on your web properties. Our digital marketing team of creative, passionate experts loves what they do, and their focus is you and your business. We work to promote your digital expansions by identifying your potential sources in business. Our team work collaboratively with small to medium sized businesses to help them succeed online. Our existing client base reflects our flexibility and depth of understanding in the various platforms and have been delivering the best possible results. If you want to experience results focused digital marketing services Ahmedabad based services which you can measure, optimize and improve your Return On Investment, Please feel free to contact us.